Allow us to introduce you to a new Netflix show designed in the vein of BoJack Horseman; a Hollywood legend revisiting one his best genre films; a new horror project at Netflix, and a fresh look at the Pet Sematary remake. 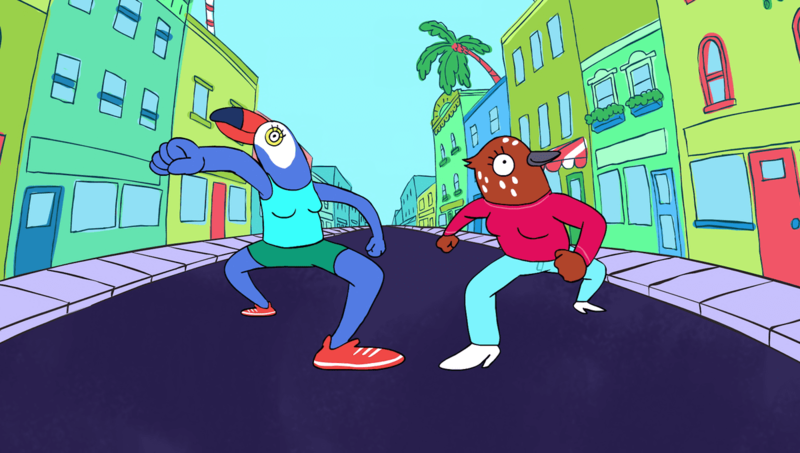 After the rousing success of BoJack Horseman, Netflix tapped the series’ producer and head designer, Lisa Hanawalt, for another animated project: Tuca & Bertie. Utilizing the same visual style and anthropomorphic approach as BoJack, the new show (arriving in early May) follows the exploits of two humanoid bird women, a toucan (voiced by Tiffany Haddish) and a songbird (Ali Wong). Steven Yeun, Nicole Byer, Richard E. Grant, John Early, Reggie Watts, Tig Notaro, Amber Ruffin, Jermaine Fowler, Tessa Thompson and more will lend their voices to the project. Season 1 of Tuca & Bertie drops on Netflix Friday, May 3. Season 5 of BoJack premiered back in September, but a sixth season is already in the works. Creator of that program, Raphael Bob-Waksberg, serves as a producer here as well. Rutger Hauer, the actor known for his work in films like Blade Runner and Batman Begins, will receive a lifetime achievement award at the Lucaa Film Festival in Tuscany, Italy. In particular, there will be a musical performance centered around Roy Batty’s iconic “Tears in Rain” soliloquy from Blade Runner. The monologue is spoken by Hauer’s Replicant character just before he dies at the hands of Harrison Ford’s Rick Deckard. “The Dutch actor will participate in this special tribute: the futuristic atmosphere of the film will be recreated thanks to a setting with actors in cyberpunk costumes and the soundtrack by Vangelis played live,” reads the official release. The news doesn’t really end there because in addition to accepting the world, Hauer (75) will enjoy a retrospective of his most beloved movies, teach a masterclass geared toward up-and-coming filmmakers, and even serve on an international jury to judge the films being screened at Lucaa. The festival kicks off April 13 and runs through April 21. Patrick Brice, director of The Overnight and Creep, has been hired to helm Netflix’s adaptation of Stephanie Perkins’ 2017 horror novel, There’s Someone Inside Your House. Set in Nebraska, the book follows Makani Young, a woman haunted by the ghosts of her past in Hawaii. As she adjusts to her new life in the American midwest, Young’s classmates begin to die gruesome deaths, which prompts her to probe her own dark and personal secrets. Henry Gayden (Shazam!) wrote the script for the movie, which is being produced by Shawn Levy’s 21 Laps and James Wan’s Atomic Monster. Production is expected to kick off in the fall. Earlier today, Paramount dropped a brand-new featurette for the studio’s remake of Stephen King’s Pet Sematary. The somewhat short video includes testimonials from co-directors, Kevin Kölsch and Dennis Widmyer, and the two main stars: Jason Clarke (Louis Creed) and John Lithgow (Jud Crandall). “This is gonna take people on a wild trip,” says Lithgow. Written by Jeff Buhler, Pet Sematary rises from the dead on April 5 to go head-to-head with Shazam!